Is wichita's poor walkability holding it back economically? 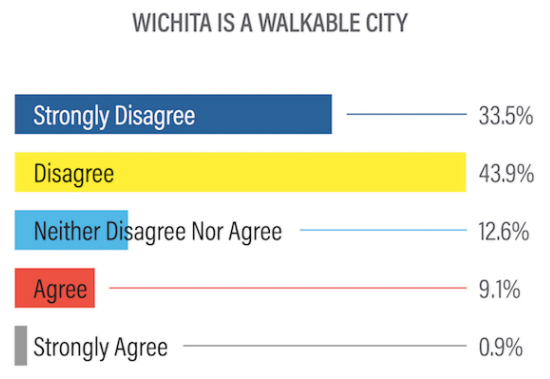 Our respondents believed Wichita is fairly inaccessible on foot, with 77.4 percent saying they either disagreed or strongly disagreed to the idea that Wichita is walkable. This means this aspect of Wichita likely won't attract millennials over other cities that are more progressive when it comes to transportation. And our peers do seem to be more progressive. WalkScore.com, a website that determines walkability and bikeability for U.S. cities, calls Wichita a "car-dependent city," which means most errands require a car. Cities with scores of 70 to 89 are considered very walkable while scores of 90 to 100 are a "walker's paradise." Wichita scored a 35 on walkability and a 44 on bike infrastructure, meaning the city has minimal bike infrastructure. This same site gave Des Moines and Omaha walk scores of 45 and Cleveland a walk score of 60. These trends aren't going unnoticed. Advocacy groups like Bike Walk Wichita (disclosure: I'm on the board) have made tremendous progress in getting more attention paid to walkability and bikeability over the last decade (including a bike share and dozens of miles of new bike lanes and paths). But clearly there is work to be done. Metabolic syndrome, FYI, is a catch-all term for people at risk of developing diabetes and heart disease. It's a constellation of extra weight around your waist, higher-than-normal blood sugars, abnormal triglyceride levels in the blood, and higher-than-normal blood pressures. A few observations about this study: we've known for a while that being alone in general is bad for you. Like, 30% increased risk of dying on any given day bad. So it's not a surprise that eating alone is associated with risk. But is it any different than being alone in general? I don't think the authors make that case. Individuals who ate alone 2 or more times per day in their dataset were more likely to live alone, were more likely to be unmarried, and were more likely to skip meals. Interestingly, alone eaters ate out less, which is generally considered a good behavior. Women who ate alone ≥2 times per day were 29% more likely to have metabolic syndrome than women who didn't eat alone. But once they accounted for other factors, like XXXXX, the assocation went away, statistically-speaking. Eating alone two or more times a day was associated with a 45% increased risk for abdominal obesity and a 64% increase for metabolic syndrome in men. This was especially true in men without spouse. The men without a spouse were 300% more likely to have metabolic syndrome, while married men were only 48% more likely to have metabolic syndrome. (it never left) Link posted here because I like the video. My disgust with this isn't related to the specter of GMOs or hybrid crops. I'm actually generally in favor of both (see the Hawaiian papaya story to understand why). I just find the idea of taking a food that is perfectly good for you in its native state and monkeying with it to make it "diet" depressing. Avocados aren't a wonder food, and their trendiness will eventually fade. But they're fine the way they are. Their high fat content has never hurt anyone, and it might even make you feel full longer. So for heaven's sake. Eat a normal avocado. Don't fall for this.